Gardening can be so much more than just your average household chore. For many people, enjoying the fresh air, conquering weeds and nurturing your plants to their full potential is a welcome escape from the stresses and complications of modern life. 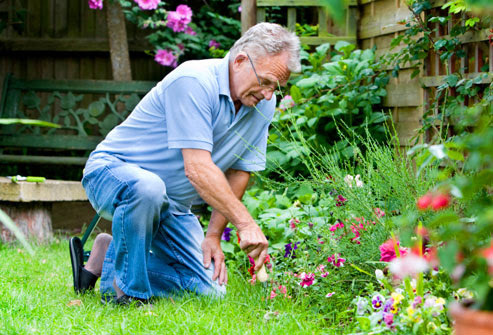 As a keen gardener, it is vital that you take good care of your back to ensure that it doesn’t come under strain during the repetitive movements associated with digging and weeding. So follow these top tips to look after your back and keep you comfortable and healthy both now and in the future. Before you start doing any physical activity it’s important to take some time to warm up your muscles slowly and gradually to ensure that they are ready to get moving. Gardening is no exception, so 10-15 minutes of simple stretches can help you to ensure that your back and joints are fully primed before you begin work. Stand up straight with your feet shoulder width apart and your arms and shoulders relaxed, then lower your right arm towards the ground as far as is comfortable and hold it for a few seconds. Straighten slowly and do the same to the left. Next, place your hands on your hips and slowly twist around to the right without moving your feet. Hold it for a few seconds, return to the centre and then twist to the left. Regular breaks offer you an important opportunity to rest your muscles and joints, as well as to make sure you remain well hydrated as you work. Take a break at least once an hour and have a cool glass of water or a cup of tea as you survey your progress so far and enjoy the satisfaction of your progress. Weeding often requires prolonged periods of bending over the soil, and the process of digging and pulling up roots can put a lot of strain on your back. The best way to avoid this is to prevent the weeds from taking hold in the first place, so try to plan your garden without large patches of empty soil between plants. Where there are gaps, spread a layer of mulch across the surface to make it difficult for unwanted seedlings to creep in. We’re all guilty of taking our backs for granted at times, and many people bend forwards as they carry out tasks such as weeding, digging and mowing the lawn. However, with the right tools and a little planning you might be surprised at how many of these activities can be carried out from an upright stance. Make sure your spade, fork and hoe have long enough handles that you can use them without bending, and look out for tools with telescopic handles if you’re concerned about storage space. Growing your plants in containers or raised flowerbeds reduces the need for bending, and investing in a good quality kneeling pad can save you a lot of discomfort. If you need to lift a bag of compost or a heavy container, ask for assistance from somebody or use a trolley to ensure that you aren’t taking the strain by yourself. If you’re moving a wheelbarrow, make a conscious effort to bend at the knees to reach the handles rather than leaning forward and bending at the hip. Forget the stiff upper lip, pain is your body’s cry for help and it is a signal that you need to take a break, do some stretches and perhaps abandon the gardening for the day. If you start to feel any lasting discomfort then it’s important to seek help and have it treated before you attempt any more strenuous activities. This post was written by Nicky Hand, who is a keen amateur gardener that plans to take good care of her back so that she can pursue her hobby well into retirement! Regular visits to a chiropractor can help you to keep your back in top condition, so visit Central Chiropractic& Physiotherapy Clinic for more details.